Post cancer cure	From 6 days & 6 nights. Improve morale and physical equilibrium. You will need a medical certificate for non-contraindication from your oncologist. PRICE PER PERSON AVAILABLE FOR 2019. Best price guaranteed: 6 days & 6 nights. From €2 610 per person. Treatment programme + Deluxe Thermal Spa view room (2 people minimum) including personalized half board. Our prices include sales tax and exclude tourist tax (€2.50 per day and per person) and extra treatments and services. Treatment program only, excluding meal and accommodation: €1 896 per person for 6 days. Please do not hesitate to contact us to book your stay. NEED TO REGAIN YOUR SERENITY, FEMININITY AND ENERGY? benefactor POST BREAST CANCER THERMAL CURE! 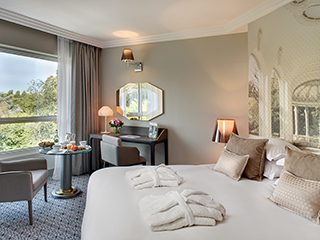 The VICHY CÉLESTINS SPA HÔTEL post cancer thermal cure helps you reconnect with an ordinary everyday life and rebuild yourself. You’ll meet with a gynecologist from the Les Célestins Health Clinic and a dietician. You’ll also benefit from a series of gentle and adapted wellness treatments, helping you rediscover your body and your feelings. The beauty treatments will help you relieve any remaining anxiety you might have. Your diet and the right choice of physical activities suited to your needs and preferences will help you back into a healthy lifestyle. VICHY CÉLESTINS SPA HÔTEL after breast cancer cure is a natural solution to prevent and relieve your symptoms.